RetailOps has experienced unprecedented success and growth in the past year due to its commitment to providing effective and efficient business management solutions to companies like BHFO and ShoeMetro. The centralized management functionality offered by RetailOps saves retailers time, effort, and money. RetailOps has been driven since inception by creating an intelligent business management platform that streamlines operations for growing eCommerce and Omni-Channel retailers. 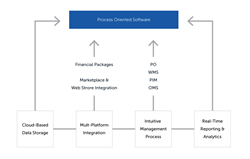 When the co-founders discovered there was no modern back-office system that integrated every functional element of operations management into a unified, easy-to-use platform available for retailers, they set out to create one themselves, leveraging over four decades of combined business management and software development experience. That platform, built from scratch and designed specifically to conquer the operational challenges of modern retailers, is the solution RetailOps offers today. Though a relatively young company, RetailOps has experienced tremendous success and growth thanks to their focus on providing effective, intelligent solutions to growing retail businesses. RetailOps offers intuitive management tools that help retailers optimize and scale operations like never before, freeing up time for retailers to focus on growing their revenue and profitability instead of trying to solve the painful operational challenges associated with growth. Understanding what an innovative, upcoming online business needs from a business management platform has allowed RetailOps to grow rapidly. RetailOps’ clients appreciate the company’s multi-faceted operations management solution, with functionality that encompasses: purchase order and vendor management, inventory and warehouse management, product information management (including streamlined product listing), dynamic data feed management, and distributed order management (including automated management of complex fulfillment scenarios involving drop-ship and just-in-time fulfillment vendors). BHFO, the largest apparel retailer on eBay, is one business that has worked with RetailOps with great success. BHFO benefitted from having RetailOps as their authoritative business management platform because RetailOps offered BHFO a scalable solution that streamlined their operational processes and replaced multiple outdated legacy software systems. Having a centralized management system meant key executives within the business spent less time hunting down crucial information about inventory, order, and warehouse needs and spent more time executing growth strategies. Vanguard Wholesale, or VGW, is another company that has benefitted from the automation built into the RetailOps software platform. Thanks to implementing RetailOps, their one-stop business management solution, VGW was able to eliminate manual drop-ship and just-in-time fulfillment processes and fully automate drop-ship and just-in-time fulfillment at a significant cost savings, positioning them for rapid growth. RetailOps has also experienced growth because they help businesses operate better while reducing operational overhead. The centralized management functionality offered by RetailOps saves retailers time, effort, and money. ShoeMetro, a leading discount online shoe retailer, was able to take advantage of the many benefits of using RetailOps software. Thanks to RetailOps, ShoeMetro was able to manage every step of their operations from end to end in a single platform. As a result, the company reduced operational overhead and shortened the time it took to bring products to market, and increased revenue by 22% in their first year running RetailOps. ShoeMetro used RetailOps to do more with less, which translated into increased profitability and reduced operating expenses. Because it was founded by retail industry veterans, RetailOps understands the specific needs of growing eCommerce and omni-channel retailers, and strives to offer an innovative software platform that specifically addresses the operational challenges unique to today’s dynamic retail environment; RetailOps helps retailers streamline operations, reduce operating expenses, and increase revenue and profitability.